Last month, the Athena Fund announced that three Israeli youth villages – CHW Hadassim Children and Youth Village, Mosenson Youth Village and Ayelet Hashachar Youth Village for Girls – have joined the Laptop Computer for Every Teacher in Israel program. The program provides laptops and 120 hours of professional training to teachers across Israel, with the aim of empowering teachers and improving student learning. 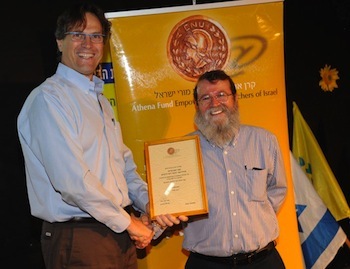 Athena’s Laptop for Every Teacher in Israel program has so far distributed laptops to more than 11,000 teachers in 939 schools and kindergartens in 430 towns, cities and small communities in regional councils, together with professional training courses. The laptop distribution is made possible by contributions from Athena Fund’s various partners, including United Jewish Appeal, Bank Massad, the Israel Teachers Union’s Fund for Professional Advancement, WIZO, local authorities and others. CHW Hadassim is located north of Tel Aviv and has 1,300 students. It is one the largest youth villages in Israel. Local area students attend the school, in addition to 200 from difficult or new immigrant backgrounds, who reside in campus dormitories. Hadassim High School offers a full academic course of study in preparation for university. The youth village also provides a wide range of specialized studies tailored to the interests and needs of outstanding students, as well as those who are experiencing scholastic difficulties. Among the subjects offered are criminology, natural sciences, agriculture, horse breeding, therapeutic horse riding, art and sculpture, and photography. There is also a musical group called Ethiopian Sun, which performs all over Israel. Mosenson Youth Village is in Hod Hasharon, north of Tel Aviv, with more than 800 students, nearly 130 of whom come to study in Israel from North America and countries around the world. The youth village consists of a high school and a boarding school where about 220 students live. The high school is known for many special programs, including one in agro-ecology that deals with environmental issues; a sports program that is ranked in the top five in Israel; a film and communication class; and an excellence class that studies science subjects such as math, chemistry, physics and biology at the highest levels. Ayelet Hashachar, located on the Golan Heights, is a religious boarding high school, where about 100 girls live and study. In addition to standard subjects such as math, English, history and science, students also have an opportunity to focus on special subjects, such as communications, film and agriculture. The girls also attend a variety of enrichment classes, including nutrition, consumerism, the environment and art.